…over a period of a few years in his own garage. The end result has taken a ton of dedication and countless sleepless nights but it is one of the most talked about cars in VIP circles, having graced the cover of VIP Car magazine and having been featured in VIP Style magazine, the two leading publications specialized in covering this scene. 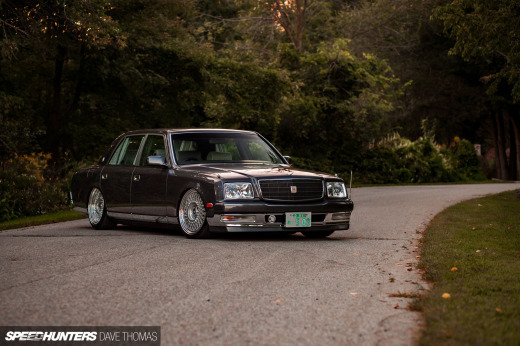 The obvious thing that makes this car so unique is the Toyota Century front-end conversion which has drastically changed the usual lines of the Celsior. The grafting of the trademark grille and lights was all done by Mizuno-san himself and at the same time throwing in a ton of K-Break aero goodies in the mix. Since seeing this car the first time earlier this year on the Bee Dragon stand at TAS, Mizuno-san has done away with his old black/silver K-Break Hybeed Fivesta wheels and fitted a polished version of the same model. The wheels measure 9.5Jx18" fore and 11.5Jx18" aft, running Yokohama rubber, 215/35R18 up front and 255/35R18 at the rear. Mizuno-san likes to enjoy his car as much as possible so on top of coming up with looks and a stance that allows him to drive the car hassle free on the street, has gone nothing short of crazy in the interior. There isn't a single piece of trim that isn't either covered in fiery red alcantara or beige leather, including the headliner. Even the seatbelts have been swapped out for red ones! The attention to detail is mind blowing. 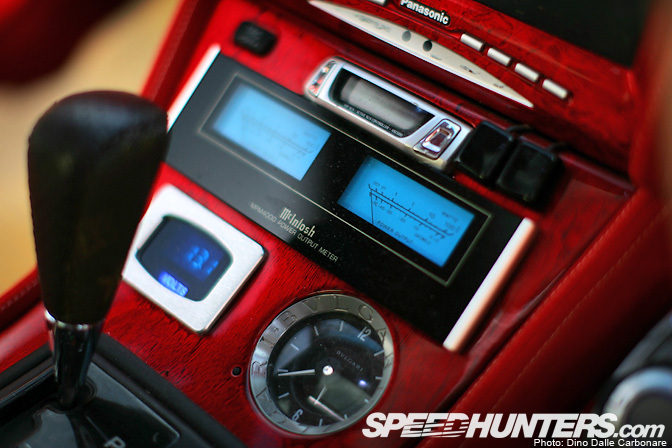 This is the custom center console, which houses some of the McIntosh based audio system as well as the air suspension controller, a Voltmeter and a Bulgari analog clock. 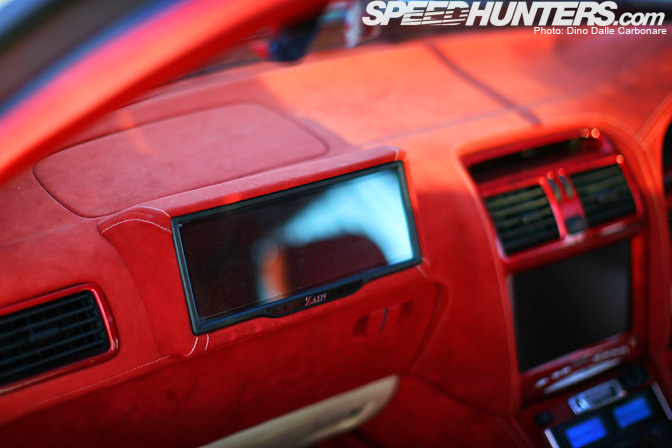 The bezel around the Panasonic LCD screen has been given a red marble finish in order to fit in with the surrounding stitched alcantara dashboard. The shifter is upholstered in authentic Louis Vuitton material and leather. The front passenger side gets its own LCD screen. A defining factor of any authentic bippu ride are of course curtains, something that not only helps protect from the harsh rays of the sun but conceal your identity in case someone in the opposite lane dares look at you! 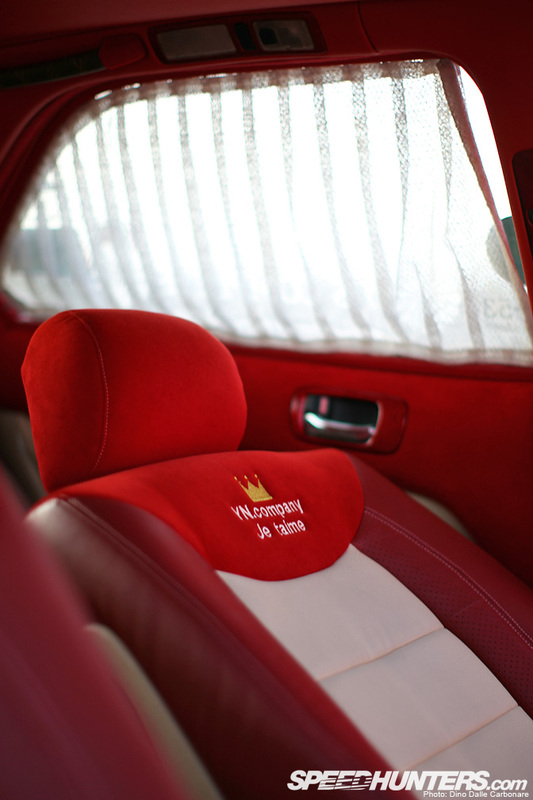 Hanging from the rearview mirror is a decorative fusa (or tassel) something commonly found in VIP cars. The little red omamori (amulet), on the wiper stalk is there to protect Mizuno-san when driving, a sort of lucky charm that can be purchased for ¥500 at Shinto shrines. 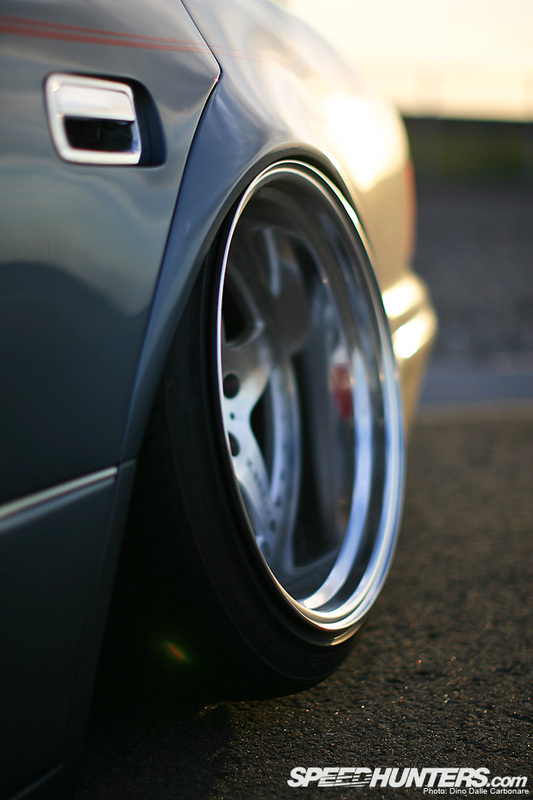 …which, when the air suspension is lowered to its lowest setting, rests right on the ground. Mizuno explains that to help obtain such a slammed look he had to cut the floor out and reposition it a few centimeters higher so that there would be no obstacles in the way, something that surprised me as I had no idea that amount of work went into creating a complete car like this. More metal work and fabrication followed in the fender area to create what Mizuno-san refers to as "semi-blistered fenders," only gently widened to help obtain that tsuraichi or flush look with the rims. On the inside of the fuel filler cover Mizuno had an airbrush artist recreate a picture of Ayumi Hamaski, his favorite Japanese pop singer. 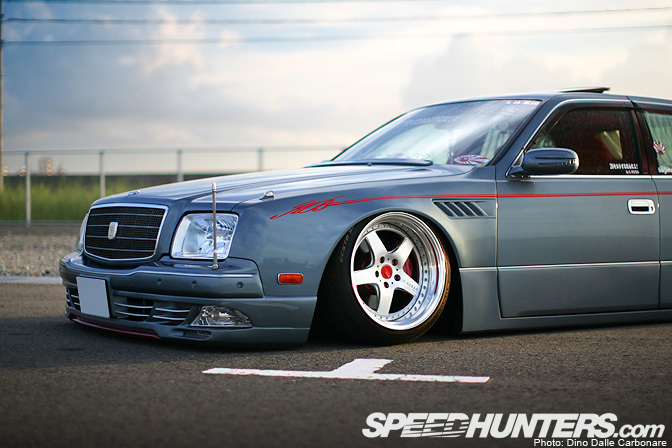 This seems to be the latest fashion in the VIP sedan world! …as well as on the sides and rear. 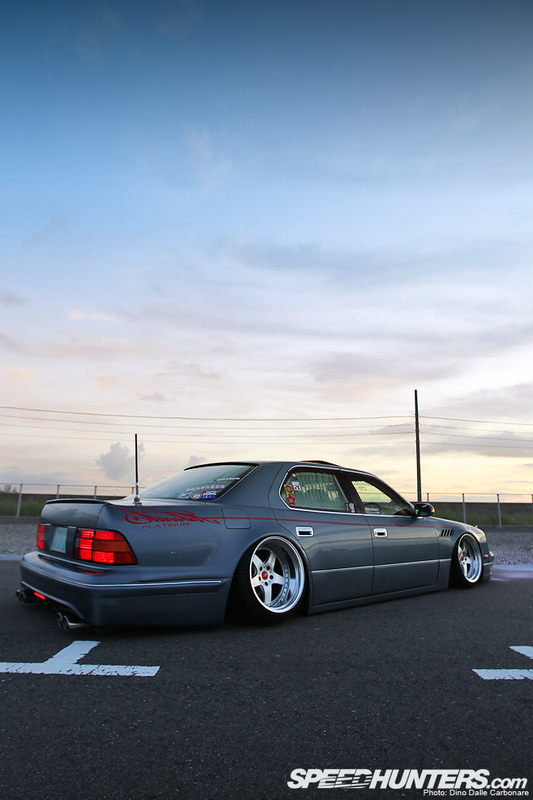 The stock air suspension allows the car to be lowered right on the ground thanks to the compressor controller that Mizuno has fitted, but he has to lift the car up in order to drive around. 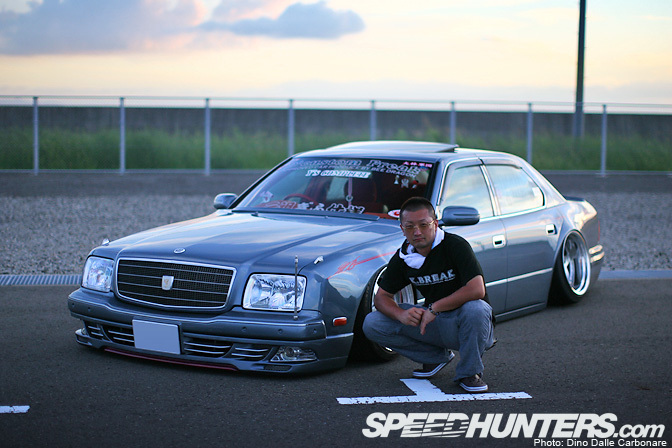 This is currently one of the most well known VIP cars in Japan and probably the most unique as it combines, on top of the front-end conversions, tons of custom touches. It's uniqueness that gets you noticed in this scene, standing out with fresh new ideas but at the same time sticking to the fundamentals that make a VIP car what it is. its amazing the work put in to obtain a certain look, i love it. awesome, kinda wish more stuff like this hit the states! As much as I dislike the VIP style (I'm too practical for it), dammit this car gets my respect. I like the amount of detail that has gone into the interior. I also like th century conversion, but overall, this is a little over the top for me. There's nothing like a Junction Produce car. 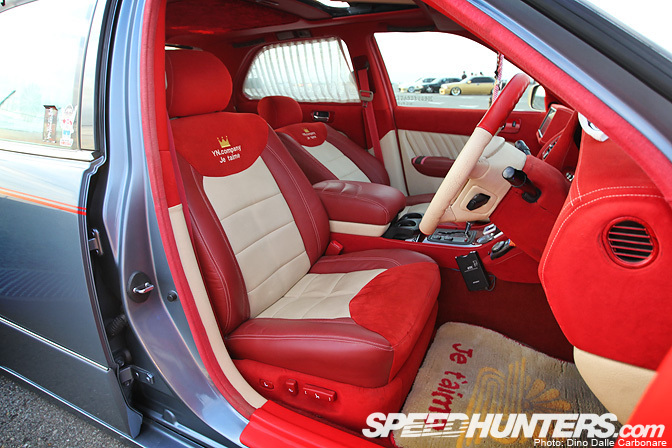 Very nice, the interior is too much, the seats look ruff in my opinion, but then again the detail on the exterior is amazing!! "Mizuno explains that to help obtain such a slammed look he had to cut the floor out and reposition it a few centimeters higher so that there would be no obstacles in the way"
Holy Sh--! But i gotta admit tho, the century front doesnt really sit well on the celsior. Not my cuppa' tea, but kudos to Mizuno-san for his dedication & passion. Another car crafting gold medal nomination! I don't normally like VIP stuff, but this car is off the hook. I'm loving that interior, especially the audio/video installation. First of all I wanna say I respect 100% of this man`s work ,dedication and passion for creating his car.I`m a car nut and though I don`t like some forms of manifestation I try to be open minded and try not to be a hater. But MY opinion regarding this VIP -trend or whatever it`s called it`s kinda lame.The first thing that came into my mind when I saw this was " like a cheap motel that tries to look like a luxury 5* hotel.And this is "cheesy-ness" all the way,I know it`s a personal view/taste but what is with that interior? It may have alcantara ,and Louis V leather but it isn`t matched at all...plus you have a Bvlgari whatch next to a plastic el-cheap-o looking dials ( not the audio sistem,the other one). Trying not to be a hater..but that is my opinion. Im guessing if I have a different opinion the comment doesn`t get posted? So clean, so complicated without looking it. Love everything about the VIP Scene..Building a Celsior once the civic is done for the 3rd Gutterball! "I really don`t seem the logic in it"
do you actually see logic in modifying any car. 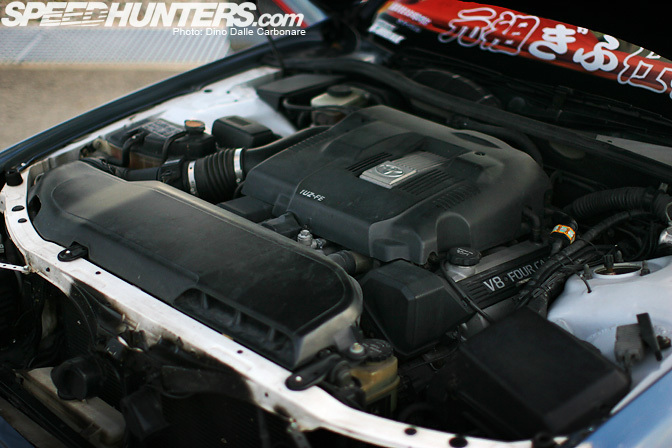 Every investment you make in modifying a car is in reality a complete waste of money. He is doing it because it is his passion. The logic is simple, he enjoys it and takes pride in what he does. He put in the work to create what is to him an amazing peice of art. He might not see the point in creating a car that can tackle the track because that is not where his interests lie. Not a big fan of the red interior but I love the idea and style. This was also in SS wasn't it? And what is the thing sticking out of the front bumper?